"yes, Virginia, dogs can fly"
There the Desk and Mrs. Desk were, just going to the pet store to pick up some supplies for the various critters when we saw one of those displays out front that you just can't walk past. There was a video screen playing some highlights, all sorts of printed information, a couple of trophies, and a dog. The dog's people (the Desk just heard the voice of its high school English teacher saying that people do not belong to animals... oh well, he got over it) were all excited and talked up this event that was happening in a couple of weeks, "just down the road." Mrs. Desk wanted to go. What it was was the Delmarva Dock Dogs "Dog Gone Fun!" event at a farm just east of Dover. [Note of Explanation for the Uninitiated: the sport of "Dock Dogs" bills itself as the fastest growing sport in the country (whether it is or not doesn't matter). It is where well trained, or at least well meaning, dogs run down a specially designed dock and jump out into a body of water to retrieve a toy. There are classifications for the dogs, and the handlers. The jump is measured from the edge of the dock to where whatever the rearmost part of the dog is hits the water (tail, hind leg, haunches, whatever). There are local competitions, such as this one, regional events, nationals that are shown on TV, and even a World Cup type event. There were three groups participating, the Dock Dogs of course (much more on them later), the DelMar Waterfowl Retrievers, and the Blue Heron Agility Association of Delaware (see links below). You also had Greyhound Pets of America, the Sussex County SPCA, Concord Pets, and even a newly minted agent from Aflac insurance participating. 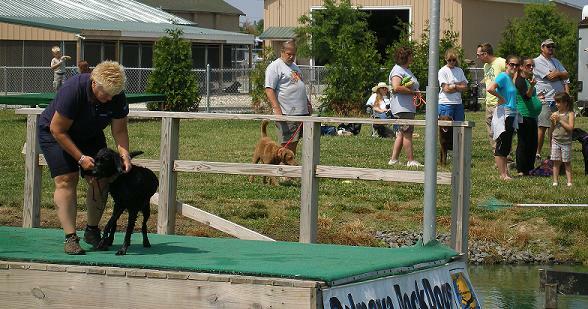 The jumping dogs, and their handlers, had come from all over the Mid-Atlantic to participate for the weekend. For some, it was their first ever competition, others were old hands in it with a board full of ribbons and a couple that had competed at the higher levels. And that goes for both the dogs and their people. 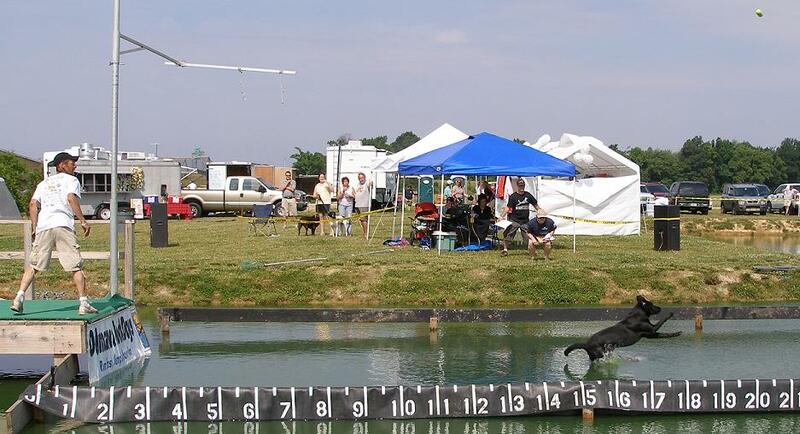 The Delmarva group had been at this since 2007, the national organization for the sport itself hung out its banner in 2003, but retrievers and other water dogs have been jumping off docks to bring stuff back since, well, since ponds and sticks and dogs and kids were invented. One thing that surprised the Desk was that a majority of the handlers throwing the toy for the dog were women. Whether or not that trend is representative of the national sport or is a peculiarity of the local club, or even this one event, is unknown. One thing is clear though; this sport isn't limited to "good old boys" with their "gun dogs". Oh, no, far from it. At this weekend's event you had dogs that were born and bred retrievers and sporting dogs such as the Irish Water Spaniel that put on a good show for its breed, and some that were, well, one was an over excited "Labrodoodle". A few had been rescued or adopted from shelters. Other appeared to have discovered the sport rather late in life, and while they made a good effort and were enthusiastic about it, their jumps were, shall we be nice about it... something barely more than just falling off the dock. The Dock Dogs also do something called Extreme Vertical which is where the dog jumps UP and out, instead of just out, to grab a toy suspended from a pole above the dock. Then there is retrieving categories and other related contests for dogs with various talents and abilities. Of the First Wave for the Big Air competition, where the Desk spent most of its time trying to catch an action shot of a flying dog, there were several jumpers that cleared the twenty foot line, and one that did better than twenty-five feet. Now, that's twenty-five feet from the edge of the dock to where the last bit of dog hit the lake. One full bodied Chocolate Lab from Maryland cleared seventeen feet! That was a lot of canine to propel that far out over the water! There was even a snack bar from the Cedar Creek Market where you could get one of their excellent burgers and a dill pickle that has to be seen to be appreciated. Rumor has it that their breakfast sandwiches were equally good. Do the dogs really want to do it? Most do, and there is no mistake. Face it, would you want to be the one to try to make a Doberman Pinscher do something it really didn't want to do? Not only that, could you make a Doberman that didn't want to go jump in the lake do it to the tune of Seventeen Feet Eight Inches? Some seemed to enjoy the swimming part more than the jumping, but all were eager to go, and in fact, some of them didn't want to stop and get back on the leash after their turn. How far can a dog jump? That's kind of like asking how long is a piece of string. The current record is a five best jump average of just over twenty-seven feet, set by a seven year old Chesapeake Bay Retriever, with a Labrador Retriever hard on his heels at 26 feet 10 inches. For comparison, the current world record for human long jump is just over 29 feet, set in Tokyo at the World Track and Field Championships in 1991. 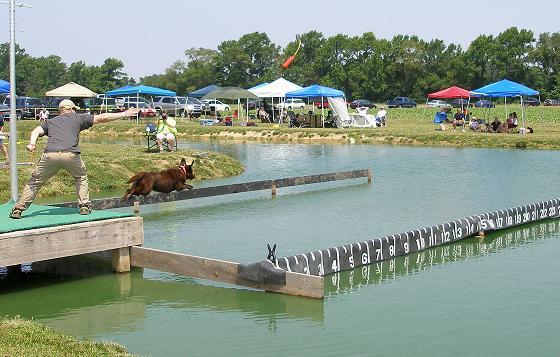 But there are classes for dogs of various abilities so Ol' Flea Trap can come out and participate and probably win the Novice category which includes dogs that regularly jump from ten feet down, to where they walk out and fall off the dock, compete. I've got a dog that can jump, can I get rich off of him? Well, in short, no, but you can try. Some do make it on the national scene, but even then, the prize money won barely covers the expense of traveling to the event, and that's the word of Mike Galloway, president of the local club. His entry into the first wave, Kendel, placed third today. The winning dog was pushing the twenty-six foot line, but some participants were quick to point out that there was a good tailwind blowing. In this case, it was literally a Tail Wind. There were One Hundred and Twenty dogs pre-registered for the various aspects of this event. For the most popular event, the Big Air doggie long jump competition, the contestants were broken into 'Waves' of a half dozen or so dogs each. Each dog gets ninety seconds from the time the handler throws the toy or otherwise engages the dog to go for the jump to take place. Most of the dogs are well behaved and sit or stand where they are told at the far end of the dock and wait for the human to signal them that it's time to go by calling them or throwing the toy or some combination thereof. Others have other ideas and spend their time running back and forth, both the human and the dog, or in one case, essentially running a lap around the pond, barking happily the whole time. Once the dog does jump the judges along the side make a determination of where the trailing end of the dog hit the water according to regulations established by the national body. While no records were broken that day, if one had been, it would have counted! After two rounds for each wave there is a short break, then the next set of dogs gets to go. Between rounds the dock is open for practice so less experienced dogs and handlers can get used to all the excitement, the noise, and other distractions of an event. How do the animal rights people feel about all this? Well, let's see, the dogs are well treated, well fed, and exercised, some are rescued from shelters to get to go outside and play, and then retire to sit in the shade next to a motor home and watch the younger generation take over. The animal rights people probably hate the whole thing, but who cares? Dock Dog events are scheduled all over the country, all summer. Some are part of a larger outdoor sports show, others are, like this one, a self contained event. If you're in the Mid Atlantic in August, come back out to the farm east of Dover and watch the dogs fly again! Outside links will open in a new window. http://www.cedarcreekgeneralstore.com/ "One taste and you're hooked."